But critics question a proposal that would subsidize rents as high as $3,000 for a one-bedroom unit. 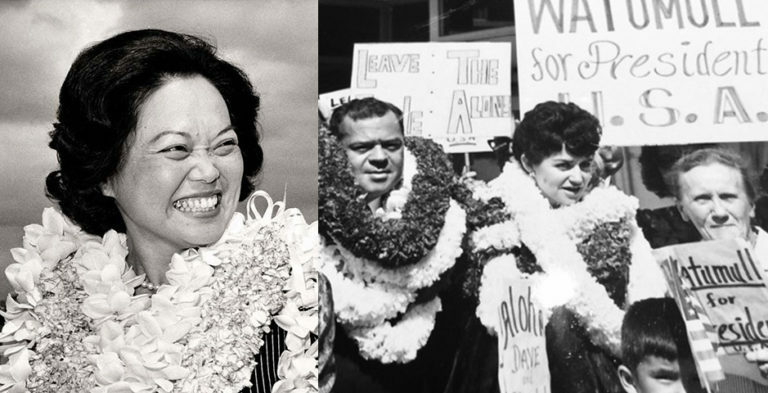 If you’re a young professional in Honolulu scouring Craigslist for a place to live, more often than not you might end up finding a room in a house in Palolo or Makiki owned by a mom-and-pop landlord. 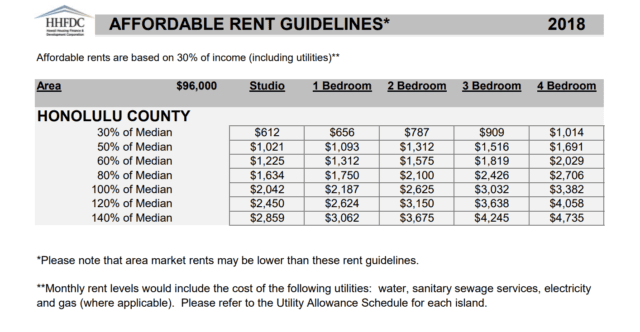 Honolulu just doesn’t have the same options for apartment rentals that exist in Seattle or New York. With a red-hot market, it makes a lot more sense to build and sell million-dollar condos, says Jon Wallenstrom of Alaka’i Development. Wallenstrom and other developers hope an expanded tax break will change that — the Legislature is on the brink of approving a $30 million annual general excise tax exemption for new or refurbished rentals to the tune of $360 million over 12 years. 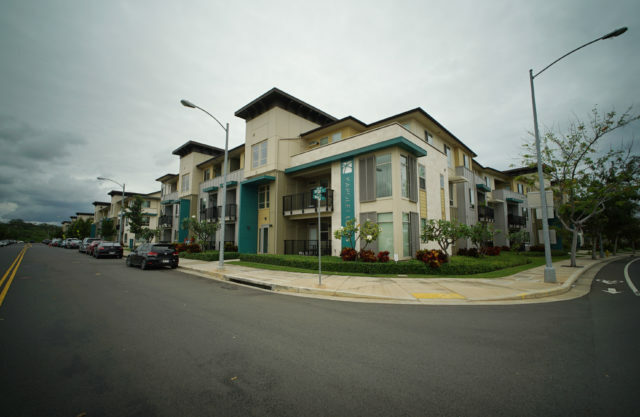 Kapolei Lofts is an apartment in West Oahu that’s an example of the type of housing the new tax credit may encourage. 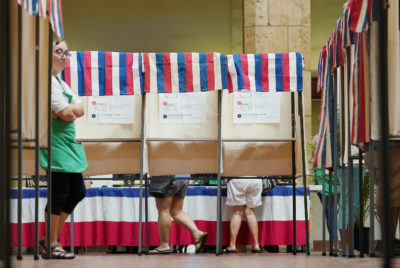 It’s part of a package to tackle Hawaii’s housing crisis that also includes a $200 million infusion of subsidies for new or refurbished rentals. Both are aimed at easing the state’s housing crunch that’s forced many local residents to move away, fall into homelessness or crowd in with relatives. Affordable housing advocates are overjoyed about the $200 million, an unexpected boon that’s quadruple the governor’s budget request. 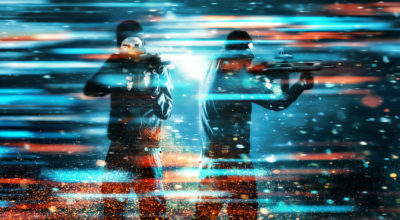 The state estimates the money could translate into about 1,600 new units, although one local nonprofit developer says 1,000 units is more realistic. That’s only a small percentage of Hawaii’s rental housing need, but far more money than lawmakers have been willing to pony up in recent years. The fund prioritizes low-income rental projects that also receive federal subsidies. The tax break is different — it would mostly serve better-off residents. Eighty percent of the units could target individuals earning up to $114,380 in Honolulu, with 20 percent aimed at individuals earning no more than about $65,000. The income levels vary by county and change every year based on federal guidelines. 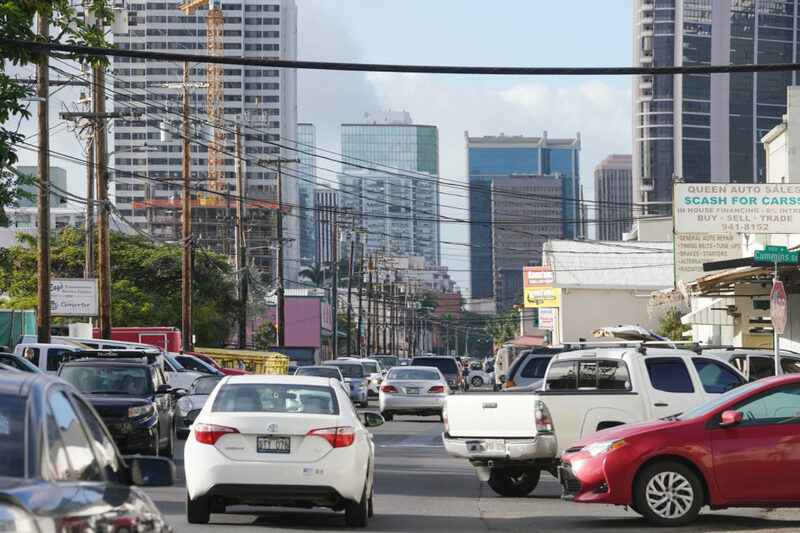 That means developers could get the tax break and still charge up to $3,062 per month for a one-bedroom unit in Honolulu — the equivalent of 40 percent above the city’s 2018 median income. That’s way too high for observers like Randy Gonce, a member of Young Progressives Demanding Action who’s running for the state House this year. “It’s an honest attempt for the Legislature to try, but for me, 140 percent of area median income is just so out of reach for so many of us, including me,” says Gonce. He’s a graduate student now but previously worked as a heating ventilation and air conditioning installer earning $16 per hour, or $33,280 per year. Lisa Sturtevant, a national housing consultant, says it’s generally better to use public funds to support cheaper housing and rely on easing regulations — like density and parking requirements — to incentivize housing at the higher end. “There’s never going to be enough to serve the people who face the most significant housing affordability challenges. My general thought is that if a local community has limited financial resources it might think of ways to use those financial resources to target the people in most need,” she says. Kapolei Lofts is one of only a couple of privately funded apartment complexes built in recent years in Honolulu and provides a glimpse of the kind of housing the tax exemption hopes to encourage. Wallenstrom worked on the project when he was back at Forest City and says its renters on average earn about 5 percent more than the city’s median income, which is $81,700 for an individual this year. The West Oahu complex has 500 units and 40 percent are market-rate. The rest are targeted at people earning no more than 140 percent of area median income — in 2018, that’s $114,380 for an individual or more than $160,000 for a family of four. Twenty percent of those units are for low-income renters. The website describes the apartment complex as a “luxury rental community” that offers a string of amenities including private cabanas and a self-service pet spa. 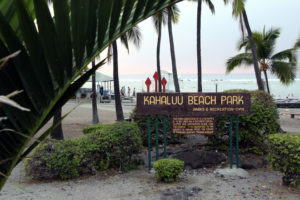 Wallenstrom believes more housing like Kapolei Lofts could attract the type of young professionals to Hawaii who work at Google or Microsoft by giving them more housing options. He says sometimes the market-rate units in Kapolei Lofts cost the same as the income-qualified units because prices change every day and depend on how much people are willing to pay. 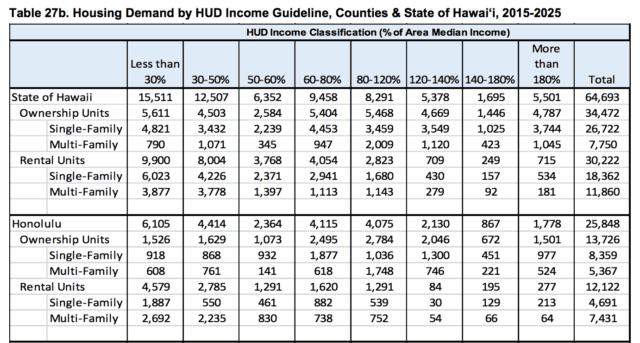 These are the state’s rent guidelines for income-qualified units in 2018, according to the Hawaii Housing Finance & Development Corp. When it comes to the expanded tax break, he doesn’t think it makes sense to focus on the upper limit of how much developers can charge for rental units because if the demand isn’t there, it won’t happen. He’s right about the lack of demand — less than 1 percent of rental demand in Honolulu comes from people earning from $98,040 to $114,380 (or 120 percent to 140 percent of area median income), according to a 2016 state study. The vast majority of the rentals — more than 95 percent — are needed by people earning less than $98,040, and the biggest need comes from the island’s poorest people, who are earning less than $24,510 per year. He says the tax break allows developers flexibility to keep tenants even if their incomes go up. 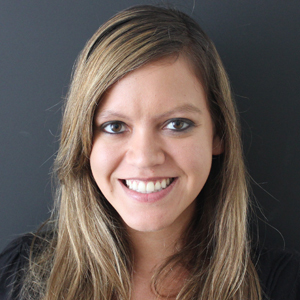 “If somebody gets married or gets a bonus nobody wants that person to get kicked out of a unit that they’ve lived in because of that,” Dos Santos-Tam says. 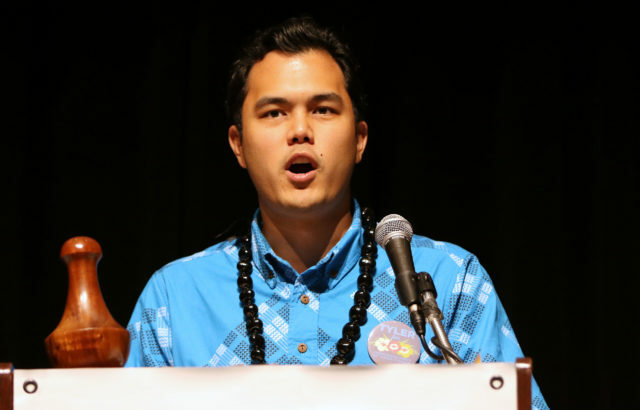 The tax break doesn’t make sense to Nate Hix, a mortgage broker and executive director of Living Wage Hawaii, the organization behind an unsuccessful push for a higher minimum wage this year. From Hix’s perspective, the exemption is simply a “giant giveaway” to developers — who are also big campaign donors — in an election year. “If the market is already demanding 100 to 120 percent (area median income) units why are we giving them an extra $300 million to do that?” he asks. Hix believes the state shouldn’t be spending money to encourage building units that cost as much or more than market rent and disagrees with the idea of building units to attract top talent. Here’s the number of units that are needed to fulfill Hawaii’s housing demand, according to a 2016 state study. The proposal was a part of Gov. 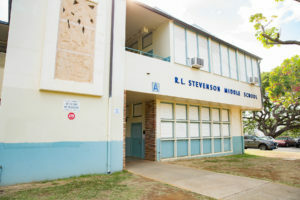 David Ige’s legislative package and was helped by lobbying from the Hawaii Rental Housing Coalition, a group of landowners, developers and construction unions. 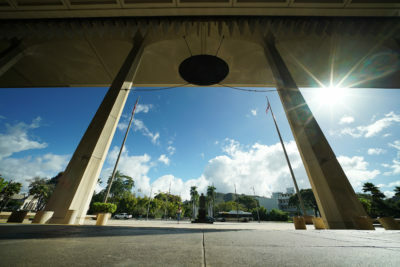 The organization’s goal is to increase housing availability for people earning from 80 to 140 percent of area median income, or from $65,360 to $114,380 for an individual in Honolulu. The Office of Hawaiian Affairs was one of few critics of the idea during session. 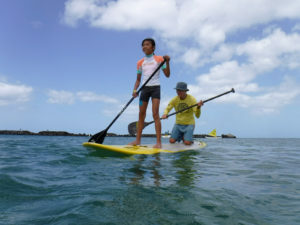 The agency dedicated to the well-being of Native Hawaiians pushed to ensure the tax credit only applies to developments where the average rent is no more than the median income — equal to $2,187 for a one-bedroom in Honolulu for a single person earning up to $81,700. Tyler Dos Santos-Tam speaks at a Democratic Party event in May 2016. Christine Camp, a developer at Avalon Group, says that allowing projects to accept wealthier tenants at higher rents is important because interest rates are going up and so are construction costs. The maximum rent includes utilities and maintenance costs too, she adds. From her view, the tax break will expedite projects that haven’t gotten off the ground. Correction: An earlier version of this story included the wrong first name for Camp. “People say 140 percent (area median income) is not affordable housing, it’s not about that,” Camp says. It’s about building supply and creating “some profit motive to allow private monies to go in” and construct mixed-income communities. 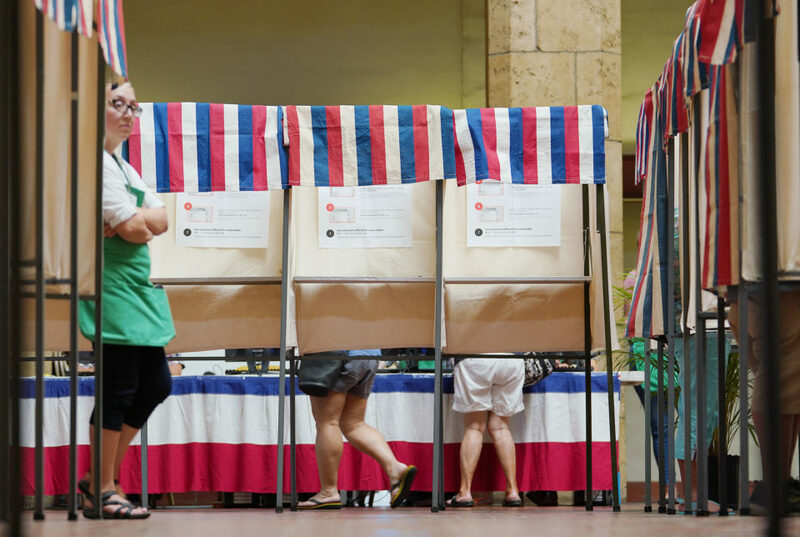 Overall, she says, adding more rental units puts downward pressure on prices — that’s something she says she’s seen in Hawaii Kai, where she recently built a rental complex. More apartments could affect the price of for-sale homes too. The median price for a single-family home in Honolulu last month was $760,000. “The more rental housing you have the less speculation you have on people who are buying the homes,” Camp says, adding that it will make less sense for investors to buy and rent out single-family homes. Dos Santos-Tam says the tax break requires the developments to accept people with vouchers like Section 8, a federal rental subsidy. That’s important, because Hawaii law allows landlords to discriminate against Section 8 renters and many do. By shaving 4.5 percent off construction costs, Dos Santos-Tam also hopes the tax break will mean more jobs for construction workers. Sturtevant, the national housing expert, says it’s telling that Hawaii is using public money to subsidize rentals for people earning six figures. “This particular policy speaks to the fact that communities are struggling with the fact that housing affordability is affecting people further up the income spectrum in a way that maybe it hasn’t before,” she says.